Stevenage chairman Phil Wallace has urged the local council to act after branding part of the club's Lamex Stadium as "truly awful". Wallace called on Stevenage Borough Council to take action to improve the North Stand, branding it "not fit for purpose". He claimed without the development the future of the club was in doubt. Stevenage Borough Council, the ground's landlord, said they were not able to provide financial support. The club, who sit a point outside the play-off places in League Two, submitted plans to redevelop the North Stand at the Lamex Stadium last year and this gained approval from the council. 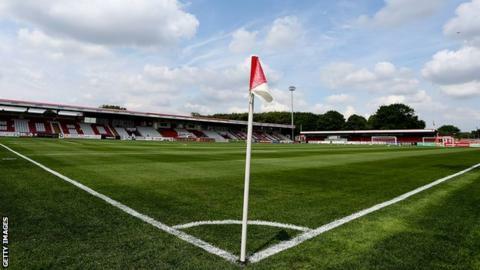 Stevenage have offered to pay £900,000 towards the cost of the £1.4 million development - including a £450,000 grant from the Football Foundation - but the council said they could not contribute to the project because of "ongoing financial challenges". Wallace said: "The 50-year old facilities were second rate when built and are now truly awful. "We want the council to stand with the club and bring the town's stadium - which they own - up to the standard expected in the EFL today. "Wheelchair users are open to the elements, half the end has no cover and the toilets are a disgrace. How is that acceptable? "Unless we can find a solution that provides decent facilities for future generations, there is little point in being an EFL club, which brings the very future of the club into doubt." Stevenage lease the football ground from Stevenage Borough Council, who own the land. The council previously helped the club develop the other three sides of the Lamex Stadium. "Our government funding has been reduced by almost £5 million since 2010, and we need to make a further million pounds of savings in the next three years," a council statement read. "We recognise and are grateful for the contribution that the football club makes to the town. "We have given Stevenage FC both financial and 'in-kind' support for many years, and will continue to do what we can to support the club, but this will not involve the commitment of scarce public funds."